Whenever you cast a 1-mana spell, add a random Mech to your hand. 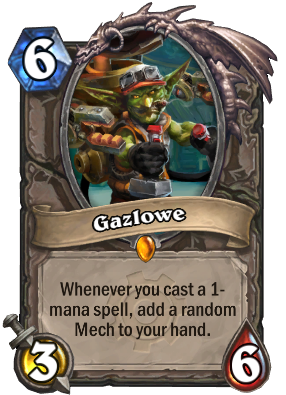 Gazlowe was voted "Most Likely to Explode" in high school. Yea I run a Warlock Mech deck with this guy. Proven to be quite effective. Believe it or not, he's my late-game finisher. Not by himself but from the value I get. He probably gets out every other game and I win the vast majority of those. I get plenty of spare parts and include 2x Mortal Coil and 1x Corruption. It's an awesome feeling when your opponent drops a huge late-game finisher. On my turn I play Gazlowe, freeze the opponent's minion, cast corruption on it, and then stealth my Gazlowe. I'm protected for an entire turn and just got 3 mechs in my hand. Sorry I'm new to the site and don't know how to illustrate my deck yet. I would certain love to see that good sir, because that sounds fun as hell! Let me know what you think and if you're gonna pursue this mechanic. It sure is hella fun! That looked really solid, noticed another interesting choice in there in Fel Canon, Would you upload the deck on here at some point? I so want to rip that off. (Once I actually get Gazlowe of course. Yea, sure. It'll be uploaded within the next couple hours. Good luck, bud! This has somewhat less trash stats than Gadgetzan Auctioneer. That's literally the only reason you'd use this over that. The cost is the same, drawing cards from your deck is basically always better than drawing a random mech, and the Auctioneer is far easier to trigger. EDIT: That said, anyone try this in Secret Pally yet? Secret Pally runs like 10 1-cost spells, so if Gazlowe isn't at least playable there I don't know where he'd be. EDIT 2: Correction. Random mechs beat drawing cards if the game comes down to fatigue. You are a goddamn genius. Mech mage with spare parts. Thro gazlowe and arch mage and you have a winning tag team. You'll be shitting fireballs and mechs left and right lmao. Anybody know if this works with Thaurissen? I think it would but I am unsure. does this also apply to 4-mana spells used after Preparation? I really love this card, I chose to craft it over Rag and I honestly don't regret it, if nothing else it's a lot more fun. A lot of people make the mistake of trying to build a deck around it, which frankly doesn't work that well. Where he really shines is in Mech Decks or Shaman/Priest decks which have many good 1-drop spells to make use of, and is best played as a win condition against control. Since mechs are on average relatively large creatures he's generally value town, and he's won me more than a few games already. My favorite legend from the new expac easily. I was thinking could be good in shaman since Earth Shock, Lightning Bolt and Rockbiter Weapon are auto include in shaman decks anyways. Paladin has most 1-mana spell since his secret is 1-mana.